In our heart of hearts we all want to know how to be a great man. When we’re young we feel as though the future is limitless. We have dreams and anyone who tells us that they’re unrealistic becomes our arch enemy – for the moment at least. And then life curbs what we attempt. It tells us that there are limits to what we can do and what we can achieve. We begin to think that greatness and these unlimited ideas about what the future holds aren’t for us. That we just weren’t destined for them, that we’re average, mediocre at best. We can improve, but only in a limited fashion. The greatness we see and read about isn’t for us. We feel this because we’ve failed to do anything great, but are these feelings true, and what kind of man actually achieves real greatness? There are those who are born into the position to achieve greatness that most aren’t, but at the same time, there are a lot of them born into this position who never become great. So even with birthright there’s a select few who actually achieve greatness. In most cases, greatness is won not through one’s birth, but through their effort, persistence, and what they’re willing to give to their quest. The examples of the latter far outweigh the former. And we all have access to the latter. However, are we born with these characteristics that greatness demands or do we develop them? I’m sure some are born with more discipline than others, but for the most part things like effort and persistence are decisions, and ones that we can all make. When you get into the mind of great men, usually by how they act in failure, you see differences from average men, but these differences aren’t innate abilities, rather, they’re decisions that they choose to make. Men like Theodore Roosevelt, Captain James Cook, and Frederick Russell Burnham repeatedly dealt with failure that would lead most to question whether or not they’d achieve anything. All great men are faced with failure, even boredom and monotony and prolonged stretches where it seems like their fortunes will never turn. What doesn’t change – at least not for long periods – is their habits, and their constant belief in their quest or at least in the fact that it’s better to improve incrementally every day than to not (ie through hard work, discipline, and persistence). What you find is that it’s not talent or an anointed greatness, but decisions. Don’t let failure knock you off course for too long, instead, learn from it. Work hard every day, don’t let emotions stop the work. Commit to certain habits that make you better every day. Fight imposter syndrome with logic, instead of asking ‘who am I do to X’, say, ‘who am I NOT to do X’. Example: who am I to give advice about manliness? Well, I have unique perspectives and experiences that, when shared, have made a difference. I have imposter syndrome from time to time but that prick gets removed as soon as the voice begins to make noise. Don’t let limiting beliefs stand in the way. You can change your beliefs. Now, can you achieve greatness? Yes, but it’s not just an ambition, it’s a duty. It’s a waste to be anything less than what we can potentially become. Too many men think they’re relegated to where they currently are, they think that who they are is who they always will be. You are your virtues. Your virtues dictate how you act, how you think of yourself, what you can achieve, and what you’re here to do, and what you actually do. Every great man has developed certain virtues that have helped him rise from the deepest depths to the greatest heights. 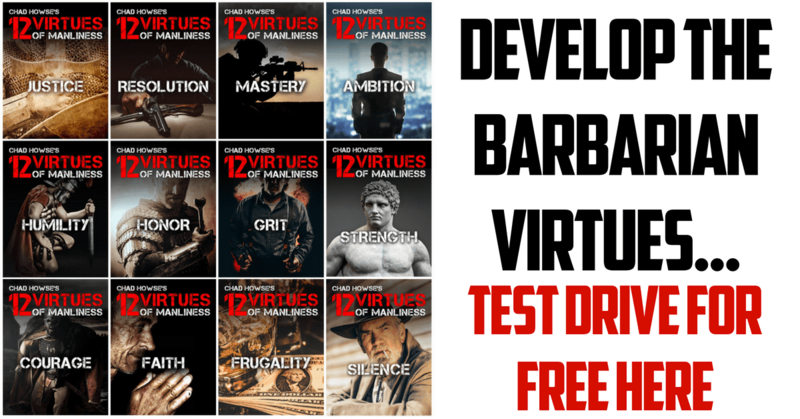 Discover the 12 virtues that will help you rise to prosperity, power, and greatness. You’re here for a very good reason, and now it’s up to you to prove that. You prove that not by reaching a final end, but by becoming great, by being great, by becoming the man you can potentially become. Get up. Get after it.